Family Entertainment Ltd is established in 2016. We specialised in creating and organising family events with iconic animation brands. 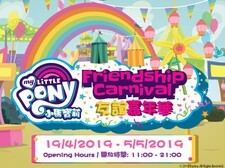 The My Little Pony Friendship Carnival will debut in Hong Kong and will tour around Greater China in 2019 and 2020.